Growing up, my 4th of July’s were simple. There were no themed plates and cups. No colorful table trimmings or decor about the patio. And definitely no red, white or blue desserts. Just good food, family, and fireworks. Nowadays color coordination seems the standard in some form or fashion. Usually, I watch others immerse themselves in this patriotic push and stick to a favorite recipe. But this year I caved. 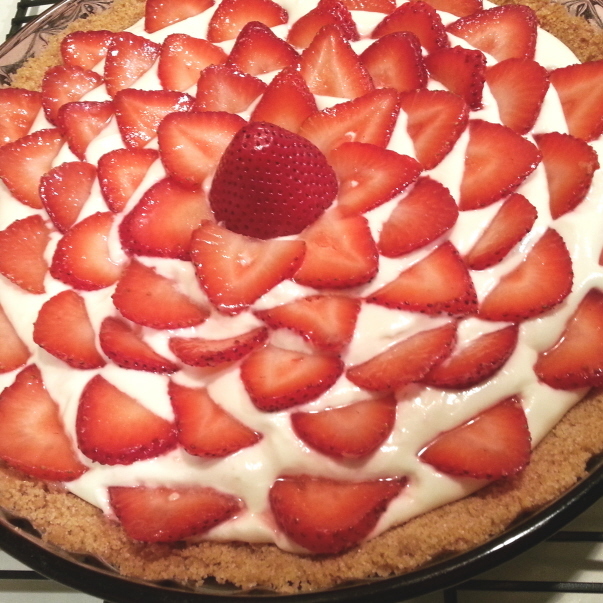 I decided to make a July 4th dessert that would complement the holiday colors – Strawberries and Cream Pie. There are countless variations of this pie, so sorting through recipes took time. I didn’t want any Cool Whip and it was too hot for a lot of baking. Thankfully, I found CenterCutCook. Her version has cream cheese, sour cream, and homemade whipped cream. Moreover, it only requires 7 minutes for baking. Reading the details, the recipe looked easy enough. Though when it’s your first fresh fruit pie, every step is an effort. I used ground graham crackers for the homemade crust. I mixed the butter and granulated sugar as directed. But I also added a tablespoon of brown sugar for more flavor. While the graham cracker crust chilled in the fridge, I prepared the strawberries. I had studied a few tips and tricks, so it seemed like second nature. Still, it didn’t fill the hour. Hence, I waited. After an hour, I baked the crust at 350 degrees since my pan was Pyrex. As the crust cooled on the rack, I made the whipped cream and filling. By the time I finished, the crust was the right temperature. I spread the filling and arranged the berries. The Strawberries and Cream Pie required at least three hours to firm in the refrigerator. Normally, I don’t have such patience. However, I was too tired from all the time management and let it set overnight. The next day I cut a piece. I went for a chunk of graham cracker crust first. It was perfectly sweet, with a subtle note of vanilla and a soft crunch. The smooth filling reminded me so much of cheesecake that I enjoyed it mindlessly. Then I noticed how its light texture dissolved within moments on the tongue. Cheesecake most certainly didn’t do that. Lastly, the juicy strawberries were a refreshing topping. The berries natural sweetness didn’t compete with the rich filing. I give this recipe 4 out of 5 stars. It satisfies without weighing you down. For the full recipe, please visit CenterCutCook.